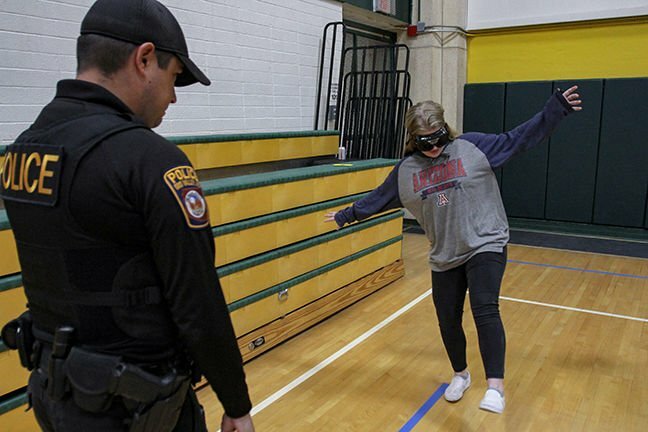 Canyon del Oro High School sophomore Mikayla Moose walks a straight line while wearing Fatal Vision goggles as Oro Valley Police Department Officer Donald Topar looks on during Teen Maze, an event intended to inform students on the dangers of drug use and underage drinking. Well over 100 Dorados participated last Friday. 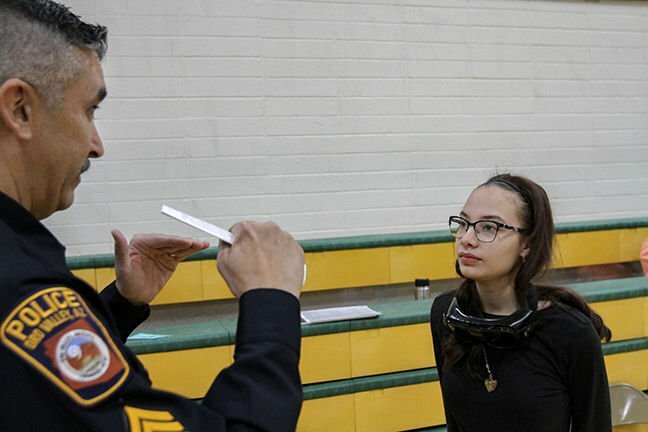 Rick Trevizo of Oro Valley Police tells Canyon del Oro High School sophomore Gabrielle Rodriguez about the effects, and dangers, of taking different prescription medications and operating a vehicle. Oro Valley Police Department Officer Donald Topar watches as a Dorado attempts a single leg lift drill, one of several roadside tests officers conduct if they suspect a driver to be under the influence. The hip-hop music cuts off and the beer pong table lays dormant. The police ask whose house party this is, but luckily for the high school students, it’s only a drill. The kids are taking part in the “Teen Maze” drug prevention event at Canyon del Oro High School, organized by the Arizona Youth Partnership. The event begins with a simulated high school party, but members of the Oro Valley Police and Pima County Sherriff’s departments soon crash the festivities, asking “Who’s been drinking tonight?” The officers then give the sophomores cards detailing their actions for the hypothetical night: drinking and driving, smoking marijuana, and so on. The students then move around different stations in the gym to see where their poor choices can deliver them: juvenile detention, court, a substance abuse center, the hospital and more. At a mock police station, students “caught” drinking and driving are administered field sobriety tests while wearing drunk goggles. Many stumble and sway over the gym floor. None of them pass. At the Banner University Medical Center station, hospital staff tell students about the risks involved in impaired driving, often sharing graphic true stories. At the court station, volunteers tell the students about the legal ramifications of drinking in driving. “Remember, 40 hours of community service is about 10 Saturdays,” a volunteer tells the students. This is the fifth Teen Maze organized by AZYP in the greater Tucson area. 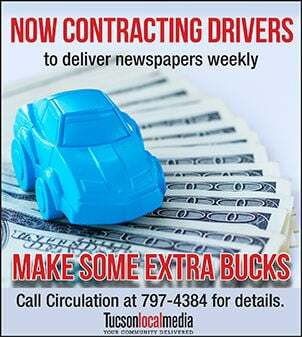 Similar events have happened at Marana and Sahuarita high schools. According to Fout, with every Teen Maze, AZYP is able to hone in its skills to make operations run more smoothly. The group can also tailor the events to issues affecting particular schools. While the basis for every Teen Maze are the dangers of alcohol, marijuana and prescription drugs, high schools in the past have wanted to focus more on vaping. “If there’s a station the students need to pay the most attention to, it’s either the ‘school’ or ‘future’ stations. It shows them how one decision can disrupt your life.” Fout said. 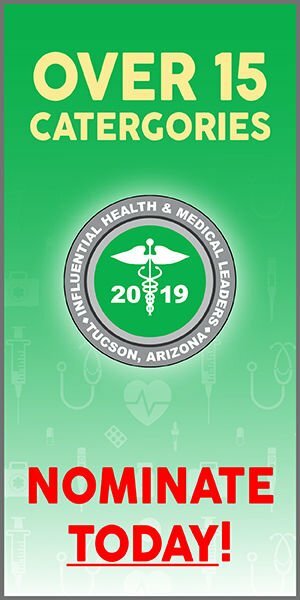 While last Friday was the first Teen Maze program at CDO High School, and all of Oro Valley, AZYP hopes it will not be the last, even if its grant money for running these kinds of programs expires. “We’re hoping to leave the schools with the templates and tools necessary to recreate events like this,” Fout said. According to Amphitheater Public Schools Superintendent Todd Jaeger, the idea to bring Teen Maze to CDO came from the parent teacher organization. Jaeger said one of the best parts of Teen Maze is educating students about the smaller aspects of their consequences they might not know about, such as, if they end up on probation, they are not allowed to cross state lines. Jaeger’s son, a CDO sophomore, also attended Teen Maze. 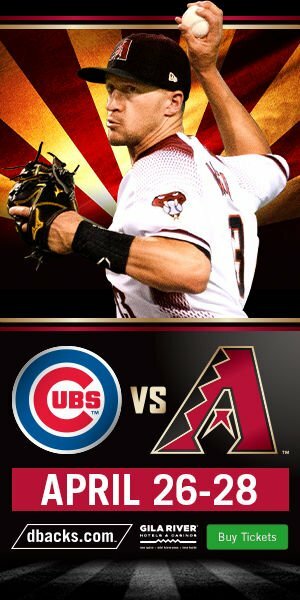 For more information, visit azyp.org.